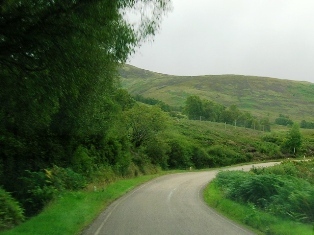 The Great Glen is a major geological fault dividing the Highlands of Scotland in two. Mountains tower either side of the Glen reaching heights of three and four thousand feet, yet the highest point on the valley floor is no more than 50 feet above sea level. 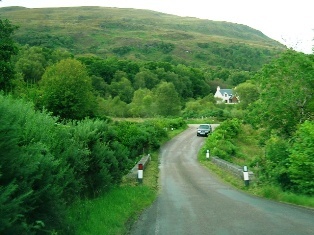 It was this quirk of nature, together with the three long freshwater lochs (Ness, Oich and Lochy) that attracted Thomas Telford when he was commissioned to build a canal to link the west coast of Scotland with the North Sea near Inverness, thus avoiding the need for goods to be shipped around Cape Wrath. It should be remembered that at the time Telford was working, it would take weeks for a man to get to London, but goods could be moved by ship in a matter of days. 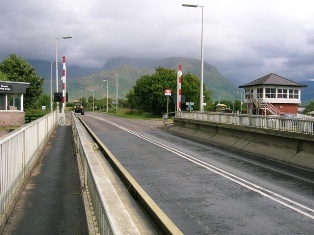 The result of Telford's work is the Caledonian Canal, which runs for some 60 miles from Fort William on Loch Linnhe to the Moray Firth near Inverness. 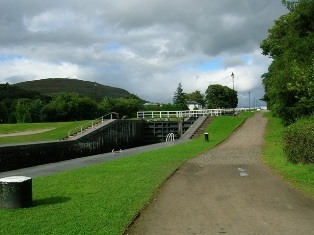 Loch Ness, Loch Oich and Loch Lochy account for nearly 40 miles of the route, but Telford still had to build a canal to serve the remaining 22 miles. 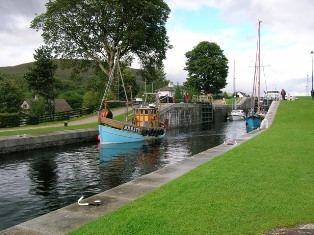 As the inland Lochs lie above sea level, it was also necessary to build a series of locks to raise boats up to the canal at either end. 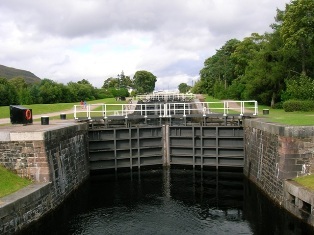 The most famous of these lock systems is known as Neptune's Staircase and can be found at Benavie, just off the A830 (Road to the Isles) near Fort William. I make no apology for including this impressive feat of engineering on a site that is predominantly about roads. Thomas Telford practically invented modern road building, but as this work shows, there was a lot more to the man that became the first President of the Institution of Civil Engineers. We start this collection at the bottom of the staircase, on the swing bridge which carries the Road to the Isles over the Caledonian Canal. The first picture is taken looking north up the flight of seven locks, though being a mere 6 feet tall meant that I wasn't quite able to get the classic textbook shot of the staircase. 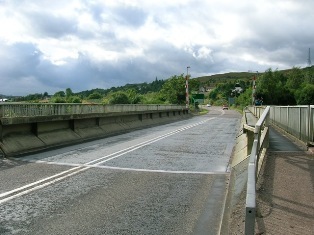 The other two photos above show the swing bridge itself. Though boats were moving in the lock system itself, none of them got near enough to require the bridge to swing, so to speak. 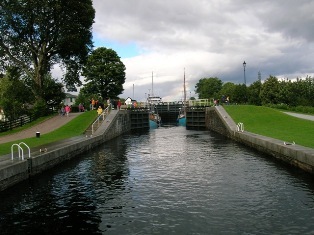 The next three pictures above show the canal itself, with the locks in action. Built to take the largest sea-going crafts of its day, these days most of the boats were pleasure craft, though I did sea one or two fishing boats around. After leaving Neptune's staircase, we decided to take the B road to Spean Bridge as there were extensive road works on the A82 associated with a new £2M cycletrack between Fort William and Torlundy. The B road is the B8004, and runs north-east on the west side of the canal, a mix of single and double track road. 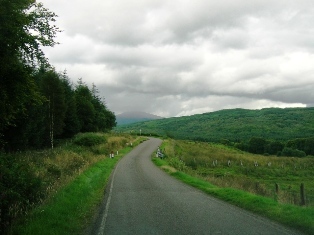 At Gairlochy, we bear right towards Spean Bridge and the A82, which we meet by the Commando Memorial. In the map to the right, the yellow dot marks the position of the Commando Memorial.